It’s Great Time for Yoga & Flamenco! Now is a great time to bring one of Eve Costarelli’s varied mindfulness programs to your school, center or special event. Eve Costarelli will seamlessly adapt her programs to fit yours and your students/residents needs. Programs are available for grades K-12; college level; corporate events; senior living facilities and private hire. All programs are inclusive and can be adapted as needed for those with special needs including physical disabilities, medical conditions, intellectual difficulties, or emotional problems, including deafness, blindness, dyslexia, learning difficulties, and behavioral problems. For over 20 years, Eve has been an arts educator, teaching flamenco, tap dance, and yoga to children through seniors citizens of all levels and abilities. She practices a therapeutic and body-centric approach to teaching to give her students both physiological and psychological benefits from these art forms. Eve is the lead teacher for Framingham’s own Open Spirit Centers Nourishing Teachers, Strengthening Classrooms project, bringing mindfulness into both the Framingham Public Schools and Hoops & Homework, an award winning after-school program for the neediest children in Framingham. 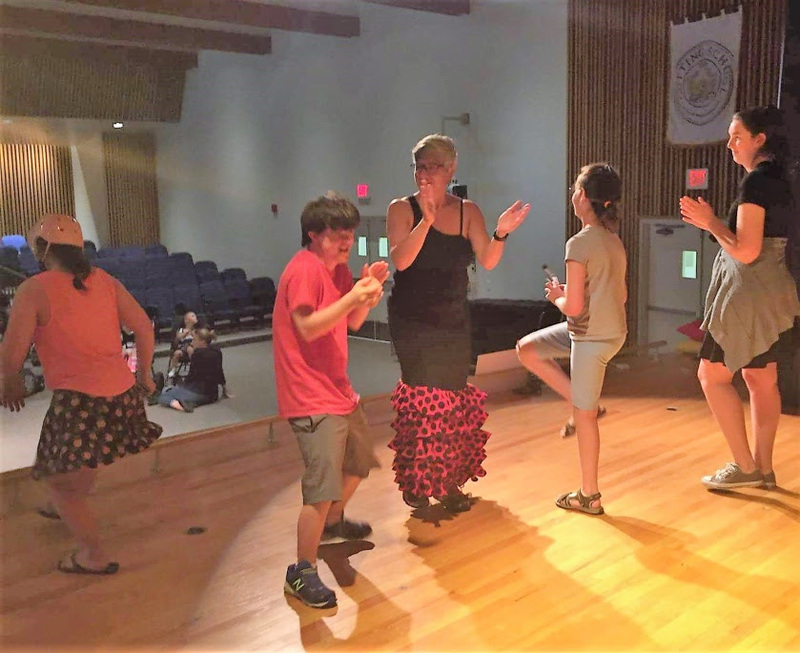 Ms. Costarelli is a familiar face on the Boston dance scene, and along with guitarist Antonio Tiriti, brings educational and experiential flamenco performance and workshops all over New England. Eve and Anthony are past members of Young Audiences of Massachusetts and Celebrity Series: Arts for All! Eve Costarelli is the creator of Always Be Dancing Expressive Arts: Yoga and Flamenco for Every/Body. Categories: Always Be Dancing Mindful Movement, arts education, children, Dance Classes, Dance Instruction, Emotional Intelligence, Flamenco, special education, Special Needs, Teens, yoga | Tags: Accessible, adaptable, Flamenco, inclusive, Instruction, Mindfulness, Special Needs, yoga | Permalink. Book Reviews by Eve: Two books from Candlewick Press that highlight dance and rhythm are Boys Dancing by George Ancona & Tap Tap Boom Boom by Elizabeth Bluemle. Boys Dancing by George Ancona is the second book I know by the author, the first being ¡Olé! Flamenco, which is another great non-fiction book about dance. Both books include fun photo illustrations that really highlight the story. In Boys Dancing, I like the foot step pattern that leads you through the pages of the book. These kids faces really tell the whole story. They are so engaging and engaged. You can see form their faces their focus, determination and joy at dancing. The instructor is equally connected and together they learn about dancing with their bodies, minds and energies. This story shows the dedicated dancers and teachers and how a whole production comes together, from school gym to studio to stage. Dance is for boys. It is community building and the story shows how hard work is fun and rewarding. ¡Olé! Tap Tap Boom Boom by Elizabeth Bluemle lives up to its name as a great choice of onomatopoeia for a rain storm. The delightful illustrations by G. Brian Karas are a cross between photo realism and sweet cartoonish images. The reader not only looks at the scenes, but also up and down and from within them. You feel like one of the pack of people escaping the rain storm! This is a very engaging and entertaining story that promotes community, friendship and the love of a good rain storm! Thank you to Candlewick Press for sending me these books. All opinions are my own. Categories: Always Be Dancing Mindful Movement, arts, arts education, Book Review, children, dance, Dance Classes, Dance In The Schools, Dance Instruction, dancing, Education, Emotional Intelligence, Mindfulness, performing arts, social skills, youth, youth dance | Tags: Art, book, books, children, community, dance, friendship, fun, gratitude, reviews | Permalink. I am a flamenco dancer. Through this dance, I communicate my kinship to the gypsies, a group of wanderers/nomads/pilgrims who migrated from Northern India during the 8th and 9th centuries. One route that they took was through Saudi Arabia and Northern Africa, before arriving in Spain through the Straits of Gibraltar. These gypsies were comprised of expert metal workers, animal tenders and entertainers. They arrived in Spain when the country was controlled by the Moors (made up of Arabs, Syrians and Berbers). In Spain, the gypsies mixed freely amongst the veritable melting pot of cultures. In Andalucía, a region in Southern Spain known as the birth place of flamenco, the gypsies found a land that suited them and found a sense of connection with the people who lived there: the Jews, the Moors and the Spaniards. The gypsies absorbed the diverse cultures around them: the music of the Moors, the songs of the Sephardic Jews and the dances of the Spaniards and then coupled with their heritage from India, they transformed the music, song and dance into the art of flamenco. My journey to become a flamenco dancer has been a deeply personal artistic pursuit. I have found that the greatest joy of flamenco is discovering my interpretation and style within the art form. As a flamenco dancer, I possess the capacity for self-controlled passion and emotional expression which becomes the underlying energy which motivates me to dance. This is my life force, my soul, my chi, my prana. Duende, the passion and inspiration within, is the heart of the flamenco artist. It is the transfer of emotions across space. It is the energetic imprint of the raw emotion released as a result of a performer’s intense emotional involvement with the music, song and dance. It is in the sum the energy the dancer takes from the earth, drawing it up through the soles of their feet. It travels through the body electrifying the the base, the core, the heart and shines forth through the crown of her head. It is in this sensation filled space that I find the connection between flamenco and yoga. I speculate that the gypsies created the movements in flamenco directly in correlation to the yoga body. The energy centers, the chakras, directly speaking to the emotional output of the artist. I believe that the gypsies brought with them an underlying understanding of yoga and that this physical, emotional and spiritual connection to the body was then naturally incorporated into flamenco’s expression. It is fascinating to teach flamenco under the label of mindfulness. I incorporate it (plus a smattering of other rhythmic and contemplative movement forms) into all of my youth yoga classes. I find that flamenco is a perfect addition as its many benefits go hand-in-hand with the benefits of yoga. My favorite part about teaching is sharing my love of movement and making both the arts of flamenco and yoga accessible. Yoga is not one tangible thing. It is not movement; it is not breath; it is not meditation. What it is, is all of these things. Each of these elements leaves an energetic imprint, a vibrational frequency on the person, and that is the yoga. I love both yoga and flamenco in my life and I live to share them. With each personal exploration of my own energy’s movement, I teach. Yoga and flamenco are deeply connected to my soul, and I am constantly evolving. I choreograph the dance between effort and surrender. I find such joy in these sensations. All I want to do is to share them with my students. Categories: Adamant Eve, Always Be Dancing Mindful Movement, arts, arts education, children, Childrens Flamenco, childrens yoga, classroom yoga, dance, Dance Classes, Dance Instruction, dancing, Education, Emotional Intelligence, Eve Costarelli, Flamenco, Health, healthy, kids flamenco, kids yoga, Massachusetts, Mindfulness, ole namaste, performing arts, social skills, spanish dance, Spanish music, special education, Special Needs, Teens, world music, yoga, yoga for kids, yoga for teens, yoga instruction, youth, youth dance, youth flamenco, youth yoga | Tags: ADHD, Art, behavior, children, dance, fitness, friendship, happiness, healthy, India, Instruction, kids, love, Massachusetts, meditation, Spain, special, STEAM, wellness, youth | Permalink. Theme: Non-Fiction. Instructional Manual for teaching tap dance to children ages 6-12. My dear friend, Thelma Goldberg, sent me a copy of her newly self-published book Thelma’s Tap Notes. A Step-by-Step Guide to Teaching Tap: Children’s Edition. This is a beautifully laid out manual and I love the catchy and useful sticky note style highlights throughout the book (I also received an accompanying sticky “Tap Notes” pad-which made it very easy for me to jot down my own notes as I went along the book.) Right from the very beginning, Thelma lays out exactly what her approach is to teaching tap to children ages 6-12 and she methodically breaks down her methods level-by-level. I appreciate how Thelma refers to herself as a student as well as a teacher. I have had the pleasure of taking classes with Thelma, so I know first hand what a dedicated and enthusiastic student she is. I also have seen a number of her studios productions over the years and can equally say she is a committed, passionate teacher, choreographer and leader. Because of this, I can say that Thelma is deeply rooted and she never stops growing! Thelma’s Tap Notes is guided by four principles: Release, Relax, Rhythmic Progressions and Full Bodied Rhythm-Making (TM). In the first part of the book, Levels, each age group: 6 & 7, 7 & 8, 8 & 9, 9-11, 10-12 is broken down into goals, review, musical rhythms, class outline, next step, combos, choreography ideas and improvisation activities. The second part of the book, Series, brings in more tap series needed for the growing dancer: Rudiment Series (courtesy of the Condos Brothers)-basically the ABC’s of tap dance; Double Heel Series-to execute clear and specific single sound movements; Shuffle Series-to get loose and increase crispness of sound; Slap and Flap Series-do I hear a challenge?? ; Paddle and Roll Series-a very advanced series needed for really good technique; Spank Series-to embody the principle of release; and Time Step Series-a series that spans classical steps through present day creations. Thelma gets into the nitty-gritty needed to develop dancers feet, musicality and expression. The closing of the manual brings in various tap dancers biographies, tying the deep seated tradition of jazz tap to its modernity. Thelma has created not only a clear, accessible teacher’s guide but a great reference manual for avid students and seasoned teachers. To note, I too am a children’s dance teacher (flamenco, tap and yoga), and I found that this guide will be a great addition to my practices of teaching-especially in helping me to lay down my own step-by-step approach. Bravo Thelma! Encore! Thelma adds: I invite you and others to send me questions and comments so that I can continue to clarify my method in a way that helps other teachers understand my suggestions. Video support will be coming slowly to the website Thelma’s Tap Notes to demonstrate the ‘series’ exercises that are at the core of my approach. Categories: Always Be Dancing Mindful Movement, arts, arts education, blogging, Book Review, children, childrens tap dance, dance, Dance Instruction, dancing, Education, youth dance, youth tap dance | Tags: Art, Book Review, Brain, children, dance, STEAM, wellness | Permalink.